Here she is! 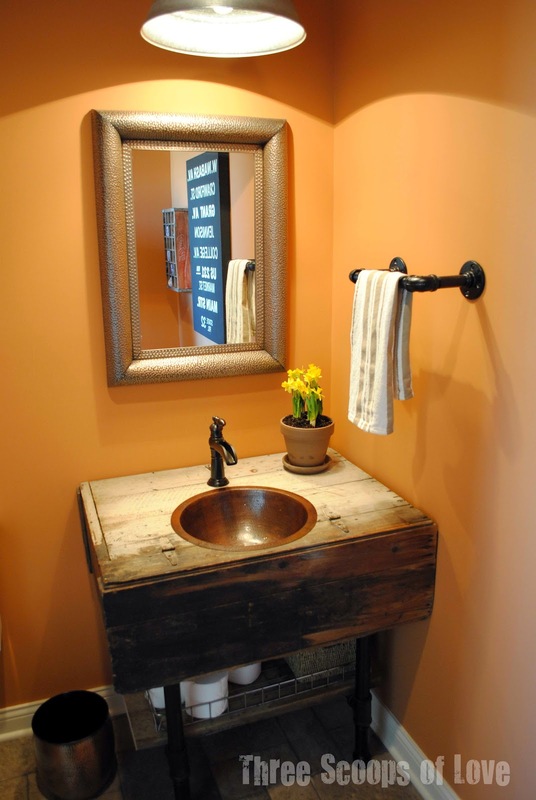 Our powder bath has been mostly done since we moved in, but we finally finished her off with a few accessories. I couldn't wait to share some pictures. I'll follow up next week with all of the details. The shining star of this bathroom is our custom vanity. 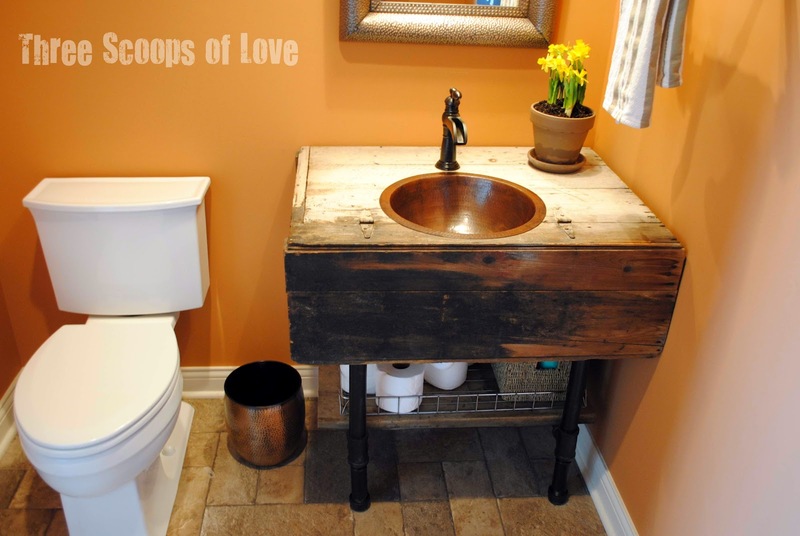 We repurposed an old wood wall cabinet into a vanity by cutting some holes for a drop-in copper sink and the plumbing. We made a base out of plumbing pipe and cut some barn flooring boards (leftover from our kitchen shelving project) to lay across the pipe as a shelf. I loved that there was still hand painted labeling visible on one end of the cabinet, so I made sure to position it so that we could still enjoy it. It's so cool to think about the history of this and try to imagine who wrote those words. The sink and vanity definitely get a reaction when visitors pop into the restroom. 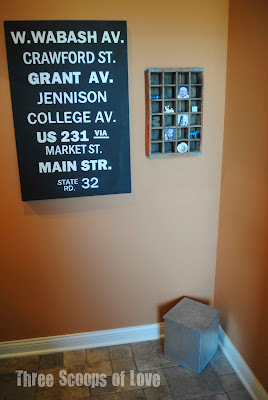 On the small wall adjacent to the vanity hang a piece of subway art that I made for my husband a couple Christmases ago and a vintage Coke crate that's being used as a shadowbox. The subway art has names of the streets surrounding his college alma mater. The Coke crate shadowbox holds tiny pieces with sentimental value and lots of our girls' treasures. 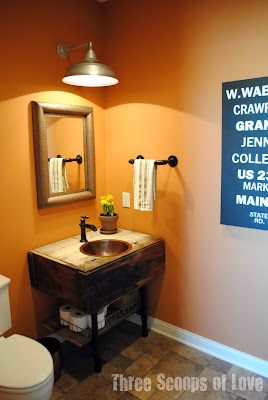 Check back next week and I'll share all of the details on how we made the sink and other fun accessories! Update: You can find the tutorial for the wall cabinet turned vanity here. That vanity is awesome and I love the subway art too! Stopping by from TT&J. Have a great weekend! This is just super looking! Girl, that vanity simply rocks! 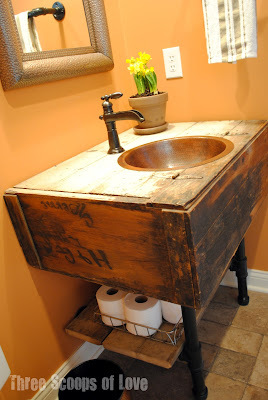 I absolutely LOVE this box/vanity...purely amazing!! I'm your newest follower.